If you’ve never heard of a Shewee, they are a urinating device that allows women to urinate discreetly without removing clothes, or sitting down. They are ideal for long walks, where a toilet is not available. The new, updated Shewee, now includes a funnel, extension pipe, and a case, to discreetly store your Shewee. 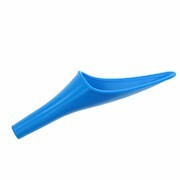 The extension pipe is an extra length pipe that easily fits onto your Shewee funnel, this is particularly useful if you wearing bulky clothing, or enjoying Winter sports. Shewee is re-usable, take it everywhere! Shewee, the answer to all your toilet dilemmas! Shewee is a urinating device that allows women to urinate without removing clothes whilst standing or sitting. The Extreme comes with a carry case and an extension tube.